Great location in the hills of Sintra, located in the small town of Malveira 6km from Cascais and 1.5km from the nearest beach. Perfect to visit the historic Sintra town, surf, eat pasteis de Belem in Lisbon or laze on the beach in Cascais. Guincho beach, renowned as being a surfers beach is less than 5 minutes drive. Cascais has a number of beaches perfect for families with shallow and calm waters, lots of beach restaurants and activities all year round. Within a 6km radius there are at least 4 golf courses to choose from if you want to spend your holiday experiencing Portugal's great golf courses. 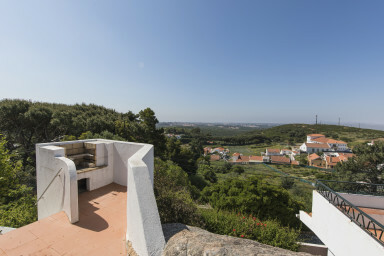 Inside the property you enter the kitchen area from the exterior stairs, passing the amazing BBQ area with a breathtaking view of Cascais, Parque Natural de Sintra and the sea. The kitchen has everything you need and is well equipped. The kitchen leads into the dining/living area with 2 larger sliding windows to ensure you don't forget the beautiful view. TV with cable channels and WiFi are available throughout. The very rustic dining table with tree stump stools gives you a warm and nature driven feel to your Portugal holiday in Cascais. Fireplace is also available for winter lets and wood is an extra charge. The two bedrooms are good size with one double bed and plenty of storage and the other bedroom being a single bed and drawer pullout bed. These beds are slightly shorter than the standard size. Storage space again available in the twin room. If you like painting, you've come to the right place. Locally Malveira has everything you need from great restaurants minutes walk from the property, a local supermarket, summer activities and festivals and adventure events for those wishing to explore Sintra hills by foot, guide or 4x4 buggy. You are also only a few kilometres from the most westerly point in Europe, Cabo da Roca. The outdoor space is plentiful with access to a long balcony which stretches the length of the property, a large terrace suntrap with loungers for those wishing to relax under the sun and of course the BBQ area which makes you feel like you are ontop of the world. Access to the property is however up some relatively steep stairs so anyone with weak legs please be aware of this. This is the price to pay for the amazing views unfortunately.